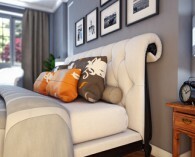 Home› Practical info›How to come ? 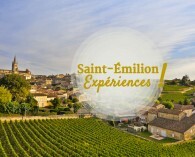 Do you want to come by car to Saint-Émilion? Motorway or roads: several ways are possible. 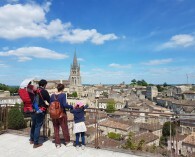 Rent a car and drive to Saint-Émilion! 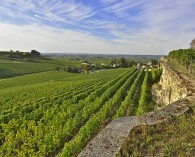 From Bordeaux or Bergerac, Saint-Émilion is only a stone throw away. With HAPPYCAR, the car rental comparison site, you can compare more than 1,050 suppliers and save up to 60%. The TransGironde bus company offers regular transfers between Bordeaux, Libourne, Saint-Émilion and the surrounding villages of the Saint-Émilionnais. In high season, the TransGironde bus stops at a 100 meter-walk from the village center. All year round, the TransGironde stops at Libourne 7 km from Saint-Émilion. You can then contact a taxi service to come to the medieval city. 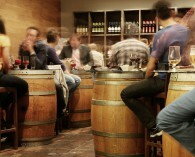 The SNCF offers regular transfers between Bordeaux, Libourne and Saint-Emilion. The SNCF line between Bergerac and Libourne is interrupted for works from January 1st, 2019 to September 30th, 2019. The Bordeaux-Libourne journey will still be done by train. Buses and shuttles are at you disposal in replacement of the train to reach Saint-Emilion. Tickets from Bordeaux to Saint-Émilion are sold starting from 9.50 €. By TGV, you enjoy the new high-speed line connecting Bordeaux to Paris in 2h30. One of the stops on the line is in Libourne (the train station is at 7 km from Saint-Emilion). More than 33 daily round trips between Paris and Bordeaux are insured from which 18.5 are direct. Tickets are sold from 25 €. 1. A small walk of about twenty minutes from the station. We point out that the access road has sidewalks on only a part of the way. Besides, the path leading to the village is sloping. 2. A tuk-tuk shuttle to drive you to the city center. The shuttle can be booked all week between 9:30 and 18:00 from April to October at (+33) 6.40.83.62.60 or tuk.tour.events@gmail.com. The shuttle costs 4€ each way. 3. A short ride by taxi or a private tourism vehicle with a driver. This service is of course reserved in advance. 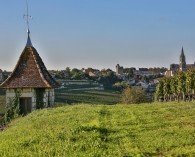 Two international airports and an aeroclub are located less than 60 km from the medieval city of Saint-Emilion. Located 54 km from the medieval city, Bordeaux Airport makes Europe and the international destinations even more accessible thanks to an offer of more than 90 direct flights from Bordeaux of which more than 80 are regular flights and more than 60 are low cost flights. 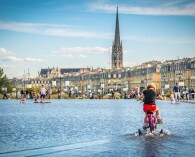 Find all the destinations served by Bordeaux Airport on https://www.bordeaux.aeroport.fr/en. Bergerac Dordogne Périgord Airport: the nearest to go further. Located 60 km from the medieval city, the airport offers you to fly to Saint-Émilion from more than 14 destinations throughout Europe. Find all the destinations served by Bergerac Dordogne Périgord Airport on https://www.bergerac.aeroport.fr/en/. Located 15 km from the medieval city, the AeroClub Libourne, located in Artigues de Lussac, offers first flights or an initiation flight. Private driver, you can also contact the airport or go to www.libourne-aeroclub.com.